Actividades y fiestas en Pradolongo por Improvistos!! 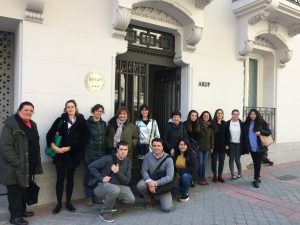 Echadle un vistazo a las acciones participativas y de dinamización urbana que están llevando a cabo el equipo de Improvistos (Gonzalo Navarrete y el equipo) en el barrio de Usera, en el parque de Pradolongo!! 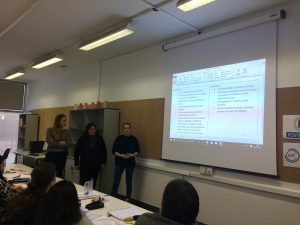 Last monday 8th April we closed this first seminar of UNI-Health, with a public presentation of the DIAGNOSIS of the neighborhood by students to the Elderly Local Forum of Usera, the Direction of different day-care centers and representant of Social Services of Usera district. 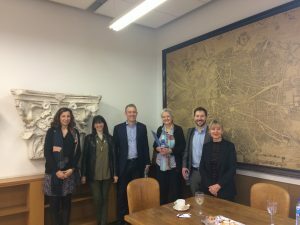 We counted as well with our guests from Newcastle University, professor Rose Gilroy and Barbara Douglas and the participation of many experts that have been collaborating with us in this first edition. UNI-Health Directors with Usera representants: Usera District Council, Elderly Local Forum and Direction of Day-Care Centers. 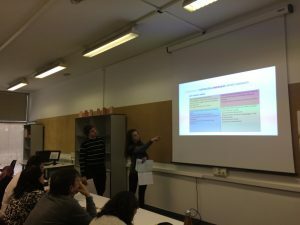 Students presented by topic groups the diagnosis of the neighborhood, showing all the cartographies and main conclusions about different aspects to take into account regarding urban health. Three main topics were presented: a city to walk, green spaces and spaces for convivence and livability. SWOT analysis, diagnosis and conclussions from students. The feedback from the different people from the public was very convenient to consider their daily lives in the analysis and complete the diagnosis with relevant information that they have shared. In the next step, we will work on some strategic proposals to address urban health and active ageing from urban design and urban planning. Representants from the Elderly Forum of Usera showing relevant information about their neighborhood. Thanks to the students for this big final effort for the presentations and thank to everybody that came to the presentation. It has been such an interesting exchange! We will come back with news and updates for the preparation of the festival next June 20th and 21st in Usera! Last but not least, thank you to everybody that have been following UNI-Health program during these months! Barbara Douglas and Rose Gilroy, from Newcastle, commenting their suggestions for the proposals and what could be done to complete the diagnosis. Please do not hesitate to share this blog, leave a comment or suggestions and contact us if you would like more information about next editions and Newcastle edition next October! 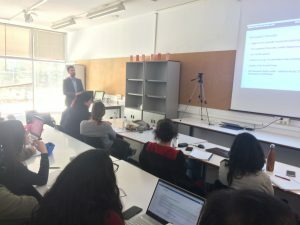 Last monday 1st April we finished our program of scheduled seminars with the participation of Pedro Rico Contreras from ESRI and the visit to ARUP’s lab. First we started the session both with theory and practical cases and examples of ESRI tools applied to many different projects. They are developing fast on 3D modelling and visualization tools in order to understand our territories better and share information in a easier way. 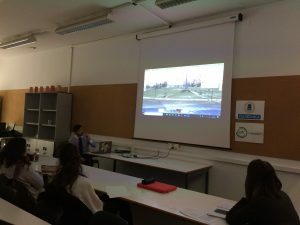 Many of the examples he had shown is a shared and growing experience with different cities and territories, such as Valencia or Madrid. Also the project StoryMaps is another application very interesting and nearer to citizens, with interactive cartographies. They are now working on 3D visualising, cartographies for NGOs and local associations and they are attracting more interest for developing citizen participation tools too. Pedro Rico showing 3D visualisation environments that are developing in different cities and territories. Group picture in the entry of ARUP’s headquarters in Madrid. In the afternoon we were welcomed by Susana Saiz in ARUP’s new lab where we experimented different accoustic simulations. They have showed us different study cases they have developed in order to test different projects and the accoustic impacts. 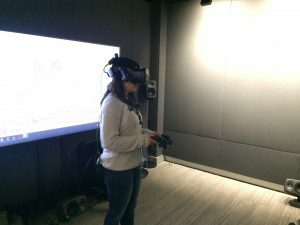 They have also introduced us to an inmersive experience of virtual reality environment in different sets and with different options for interaction. 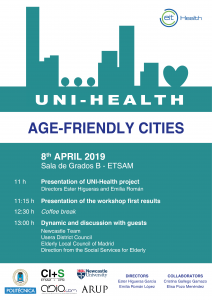 This was the last session of the seminars, but next week 8th April we will be presenting the students’ analysis on urban health issues from the poing of view of active ageing. We will count with the participation of different local agents and our partners from Newcastle. Virtual Reality experiences tested by students. We would like to invite you to the next session on 8th April in Escuela Técnica Superior de Arquitectura de Madrid in Sala de Grados B. The session will present the project UNI-Health and generate a common discussion about the diagnosis. Newcastle Team, experts on Innovation on Ageing, Elderly local agents and local administration will be invited and participate of this common session. 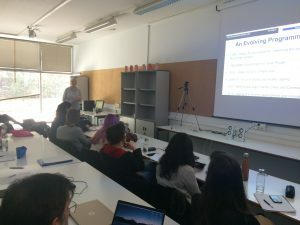 Last monday 25th April we started the day with Andrés Iriso from Dirección General de Salud Pública de la Consejería de Sanidad (Comunidad de Madrid). He showed us different methodologies to visualise on maps health data on epidemiology studies. 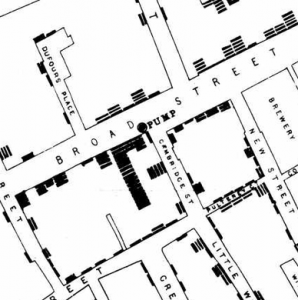 First cases of public health georreferenced studies are the ones from doctor Snow in 1854 in London, to identify the origin of different cholera epidemics. Nowadays, the main challenge is to obtain the precise data with the specific location, moreover with the data protection policies that make it very restrictive to get any data addressing health issues. There are several techniques to analyse this data from health indicators and it is important to know to read the data, as one single value can alter the proportion and rates if we are working with low densities references. 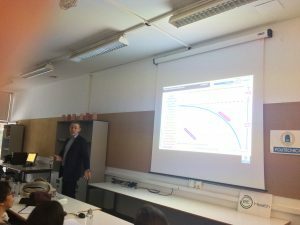 Andrés Iriso showing different study cases he had developed in his research group. 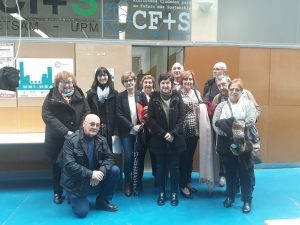 After the break, Fidel Revilla, president from Universidad de Mayores Experiencia Recíproca (UMER) explained to us the “Madrid Age-Friendly City Plan” from the point of view of the elderly who had contributed and participated in its first diagnosis part. Some of the identified problems in the first diagnosis document of this strategic plan were not taken into high priority consideration in the action plan document. Fidel Revilla explaining the main intervention axes of the Age-Friendly City Plan. The main idea that Fidel defended was to be aware of the importance of making the elderly active part of all the participation process and projects that are happening in the city. 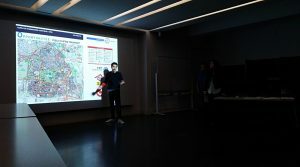 Next week we will finish our seminar program with a presentation led by ESRI and then, the visit to the ARUP laboratory! We are looking forward to meet you all there! 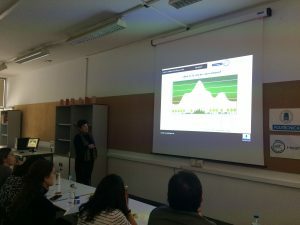 We started the day today with a review of some informatic tools by Elisa Pozo, architect and urban planner by Universidad Politécnica de Madrid. The interest of this overview is to help us to visualize the data we are using for analyse of health data and elements that configure the urban environment, such as air pollution values, radiation, or other kind of data applied for territories or open urban spaces. There are several tools that offer us the possibility of visualising all kind of data, such as GIS or other public platforms as cartodb. In this context, we have introduced some methodologies to work with visual programming software and different tools that offer us the possibility to get data and how to visualize it as well as construct our own data and then work with it. Some of the examples we have brought today have been natural drainage, air pollution visualisation, radiation and cast shadows analysis. Elisa Pozo showing a small demo of how to build 3D models and data visualization. 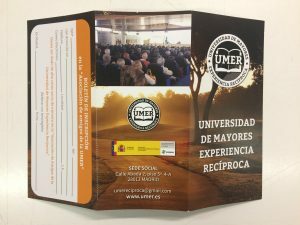 In the afternoon we have the presentation of the advances of the students. We had a review of all the analysis and information they are developing for the workshop and some feedback from our coordination team. We continue our work for the final presentation on 8th April! Next week we will have the experience of participatory processes and ageing! Today we have started the morning with a very interesting talk about environmental psychology and how the places affect us once we have built the places. 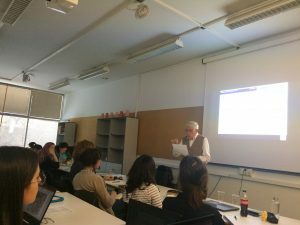 Professor Antonio Corraliza, from Universidad Autónoma de Madrid, explained to us the importance of the built environment not only for feeling comfortable and safe, but also to influence in our moods and behaviour. He told us several experiments and case studies that have shown how people react or behave depending on the built environment. 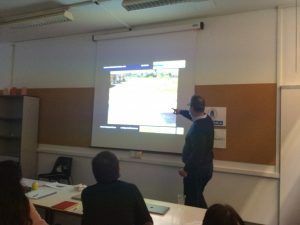 Also he explained some study cases to show evidence on the benefits of urban nature spaces in our physical and mental health, considering all the ages. Professor Corraliza explaining health from the point of view of psychology. Finally, we went by the main qualities that a space should take into consideration in order to be “age-friendly”, according to the “environmental psychogerontology” and the main problems we should think about when we work with the elderly: loneliness. 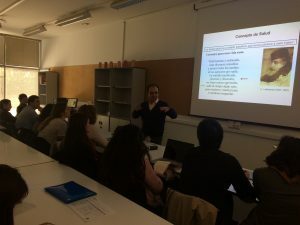 In the second part of the seminar, Carlos Rodriguez, from CEAPAT, took us across many cities and public spaces from the point of view of the elderly and handicapped people. We found out the main difficulties that the elderly face when they decide to go out to the streets. In many cities we find problems with slopes, stairs, slippery pavements, “accessible” paths in public spaces that lead to nowhere. Other elements of the urban furniture should also be considered. For example, for a correct bank design, the height and width of the seat should be properly designed in order to consider the right ergonomy for the elderly. It is necessary that they are comfortable, but the elderly have many other requirements such as proper armrests. The fountains and toilettes are very important for the elderly, as we have seen in previous session, they might need to go to toilet more often and be hydrated constantly, moreover during the summer. Also, post box, garbage containers, lightning posts… they are elements that need to be considered and correctly placed in the public space in order not to disturb the pedestrian paths. Carlos Rodriguez showing the quality of a comfortable walkable space. Last, but not least, the importance of segregated cycling lanes. We have to remember that the pedestrian areas should be protected and assured and it is not compatible with cycling traffic when it is not leisure but urban traffic. After the session, we went to Usera neighborhood again, in order to study again the qualities of the public space, looking through our new “glasses” of accessibility as we were in wheel chair or not being able to go up or down steps. The neighborhood has all the difficulties that we can imagine: pedestrian crossings not adapted, other ones that lead to no safe path, cars occupying the streets, even on the pedestrian areas, parks without any accessible way, trees invading and breaking the pavements… There was a big lack of continuity in pedestrian pathways. Evidence shows the slope exceeds the accessible 2%. At the evening, the big containers are already full. They continue to interrupt the walkable paths, the smell is nasty and unhealthy and they are located in the wrong possition to enable their easy opening. Next session we will learn practical tools to be able to represent graphically the analysis we have developed! Looking forward to meet you next Monday! This week we have the opportunity to have a look to the implementation of healthy aspects when we talk about design and operational features of projects and also a practical approach to measuring and monitoring data in a real case study. 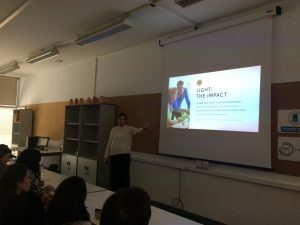 We started the day with the presentation of Susana Saiz, associate director of ARUP in Madrid. She introduced the WELL Building Standard methodology. Considering we spend more of a 90% of our lifetime in indoor spaces, we have to be aware that there are several features that influence health and well-being. These features are taken into consideration by the WELL Building Standard and it compilates several issues that shall be accomplished for the indoor quality. Air quality, noise levels, temperature comfort, lighting regulation to accompany circandian rhythms, availability of good quality food, spaces for fitness and for distress and relax are some of the features that have been explored during this presentation illustrated with examples. Susana Saiz introducing the features of WELL Building Standard methodology. Also, a brief introduction to Social Return on Investment methodology was also presented. An interesting methodology useful to value the importance of the intangible features while the implementation or development of a project. 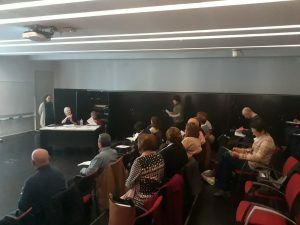 In the afternoon, professor Emilia Román, from Universidad Politécnica de Madrid, presented the project MODIFICA, a research study in which she participated with ABIO Research group. 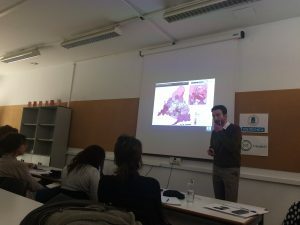 The main objective of this research was to measure and analyse the evolution of the Urban Heat Island Effect in Madrid. 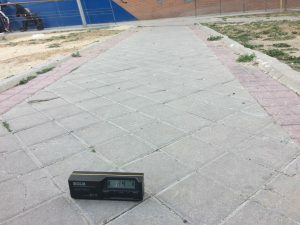 Based in the previous research “El clima urbano de Madrid: la isla de calor” (López Gómez et al., 1988), they measured the difference of temperatures along three principal axes across Madrid. This research has revealed the increase of temperatures inside the city during the last decades due to the reduction of natural surfaces. 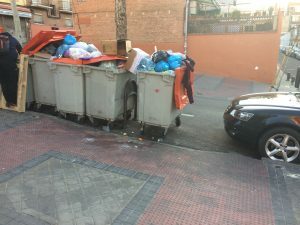 Madrid is a community that suffers a lack of natural areas and the consequences of this massive urbanisation growth have led to an important impact in climate conditions. 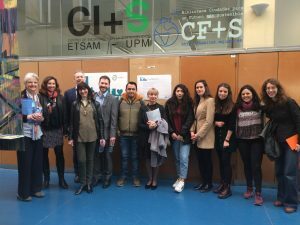 Professor Emilia Román showed us the research taken place in Madrid for analysing Urban Heat Island Effect. Through several data measuring and then an interpolation process, they have obtained a cartography that shows the differences of temperatures and the heat island effect for the different areas of the city. It is remarquable the evidence of green spaces and natural areas in city center to contribute to the mitigation of this effect. The problems associated to this urban heat island are multiples but, in the case of Usera neighborhood, the research revealed that this area had a greater impact. The structure of the demography (mainly elderly) and the poor housing conditions, make this neighborhood more vulnerable to this effect. At the end of the session we shared the advances of some of the workshop groups and their SWOT analysis on their topics. We will continue next session with this review! Group 3 first approach to the SWOT analysis of the neighborhood based on green areas and green and blue infrastructure. Group 2 showed the main weaknesses of accesibility and spaces for walking for the elderly. 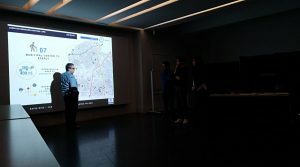 Group 1 presented us the main problems linked to thermal and noise comfort, security and identity in this neighborhood. Also, next week we we will be introduced to the concept of environmental psychology and then visit again the neighborhood accompanied by an expert on accessibility and elderly needs! 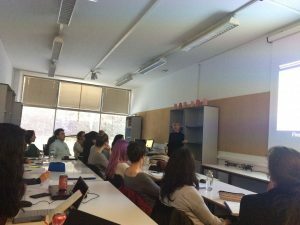 This last Monday has been a very special day as the Newcastle Team came to our seminar with new perspectives about active ageing and the experiences they are developing in Newcastle. 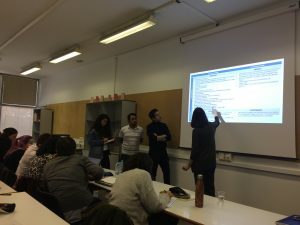 Team working session in the Escuela de Arquitectura de Madrid. Dr. Dominic Aitken opened the session with an introduction about Newcastle University and the National Innovation Center for Ageing. Dr. Dominic Aitken introducing Newcastle University and research main focuses. Barbara Douglas was the first speaker to talk about Active Ageing. Barbara has worked in the field of ageing for many years, focusing on the elderly experience to work on how to improve the quality of life of older people. She shared her perspectives and initiatives held in Newcastle and their citizenship-based policy approach in terms of Active and Healthy Ageing. Barbara has been engaged with different programs, activities and initiatives for a long time regarding Active Ageing. In the afternoon, Professor Rose Gilroy and Graham Armitage presented their work on innovation and ageing. Graham Armitage has shown the main challenges for a older population and introduced the innovation scope to this context. What will be the future in terms of innovation for the elderly? Robots helping and accompanying us? Or a society where care is integrated as part of out daily lives? He gave us a very inspirational and interesting presentation about innovation in Ageing. Graham Armitage explaining tendencies and data from their research experience in Ageing. Finally, Professor Rose Gilroy explained her research line about homes for the elderly and how these issues are been implemented in UK. “Future Homes” is a project that looks for an answer to the new challenges and necessities that arose with the ageing of the population. Rose Gilroy delighted us with an interesting presentation about our future environments and homes, conveived to answer the new necessities of all the population. The session was closed with a brief panel question to share ideas and discuss open futures for our cities to be healthier, more inclusive and sustainable. Group picture with Newcastle Team and students. Next Monday we will have the opportunity to meet Susana Díaz from ARUP and see the implementation of health issues on real case projects! Meet you there!